Dog tooth tuna (doggy), kingfish, jobfish, baboni, shark… are fish targeted with this technique and very special sport. You're already an expert or you have not practiced this technique of fishing! We still assist you and / or we will teach you a few lessons that, quickly, you can make your own fish. Warning! Big surprises await you. FEEL SURE! Everything is possible in Jigging! Technique for tracking species such as blue marlin, black marlin, yellowfin tuna, dog tooth tuna (doggy), wahoo, sailfish, barracuda, bonito… In general, all pelagic fish. This technique is used to move from point to point or to go to the Grand Banks offshore. This is often when the Tiagra screams… "your turn!" 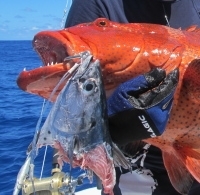 A technique that aims to present a live bait or dead (little tuna or bonito, about 5kg, mounted with a circle hook catalina 20/0) to the depth that we want, which has the effect to excite the big predators such as marlins, dog tooth tuna or sharks… We often couple with a strong surface to cover the entire water layer. their thrilling climbs at once! A technique that is practiced in the shallows, or along the reef in deep water in blank areas of industrial fisheries, sometimes several miles from the port. WARNING ! This technique is only possible in good weather. The fisherman then positioned on the front deck, above the "beds of corals" offshore or in the hunting of yellowfin tuna. It is necessary to have good weather on the fishing grounds in order to practice the popper. During your stay on board, you will discover all these techniques, taking into account the weather, currents, moon and water temperatures. Our intention is also to explain: why such a method? why such an arrangement? how to animate your lure…In all cases, your questions are welcome and we take special care to answer you so you can make progress in these different fishing techniques. What has been implemented on a board, you will improve your techniques in fisheries that you practice at home.